There are four types of saddle available from Genetic, with the Monocoque Carbon top of the range, aimed at racers and those keen to reduce their bike's overall weight. As the name implies, the saddle base (the bit you sit on) is made from carbon and the saddle rails (the bits you attach to the seat post) are also carbon. As far as I can see, only the slightly padded fabric covering the base isn't made from carbon. Although this saddle may be aimed at racers, several test rides on the Monocoque proved that it's comfortable for sportives and other long rides as well as short time trials. I'm assuming the carbon in the saddle absorbs some of the vibration coming up from the road, just like carbon forks and carbon frames. 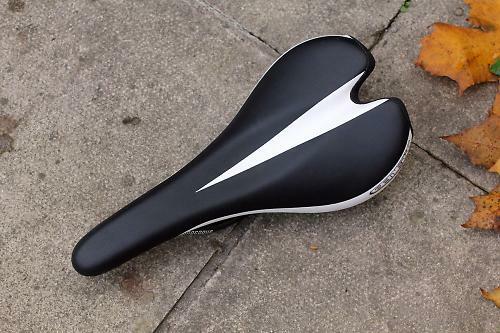 Genetic doesn't specify, but this saddle seems designed for male cyclists. It's fairly narrow, measuring 128mm across the widest area at the back of the saddle, and about 40mm halfway down the nose. Although described by Genetic as having a 'flat-top shape', the Monocoque has a curved profile, with the lowest portion of the saddle about 13mm lower than a horizontal line drawn between the highpoints at the nose and back. There's also a shallow groove along the length of the Monocoque, as is normal for many saddles these days, to reduce pressure on the perineum when cycling. On my test rides, this groove seems to work, perhaps combined with the curved profile mentioned above, and I felt no discomfort in my, ahem, monocoque area. This saddle weighs a claimed 178g, although it tipped the road.cc scales at 162g. Either way, this is light, but there are other saddles out there, from Genetic and other brands, which dip beneath 200g without requiring carbon, and so are a lot cheaper than the Monocoque's £99 price-tag. But compare the Monocoque against other carbon saddles, and the price ain't so bad, with the likes of Selle San Marco and Fizik selling similar items for £130 to £170 – although admittedly some of these are even more featherlight and get down to around 150g. But there again, for many road cyclists, especially those doing longer distances, it's not about just weight, nor just price. It's about the best combination of weight, price and (most important) comfort. 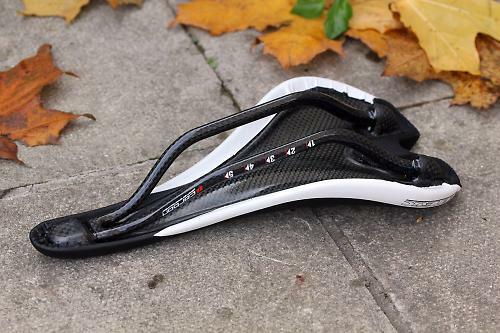 And on that basis the Genetic Monocoque Carbon saddle is well worth considering. Light and comfortable carbon saddle. Not cheap, but compares well against similar saddles from other brands. I'm not sure about 'superlight' as there other saddles available weighing up to 100g less than the Monocoque, but it is light, and the rest of the blurb is fair: the saddle is indeed comfortable. The Genetic website is fairly taciturn about the saddle's technical aspects, highlighting key features as 'Monocoque Carbon construction, Flat-top shape, Exclusive Soft Carbon base area, Ovalised carbon fibre rails.' And that's yer lot. Construction seems very good. As well as using the Monocoque on test rides on the road, I've also fitted it it to the bike I use for trails and the occasional cyclo-cross sportive. Blasting along the bumpy tracks and byways of the Cotswolds don't seem to have caused this saddle any harm. Performance is very good, in that this saddle is light and comfortable. The Monocoque weighs a claimed 178g, and shows 162g on the road.cc scales, which is indeed light, but there are other saddles out there, from Genetic and other brands, which dip beneath 200g without requiring carbon, and so are a lot cheaper than the Monocoque's £99 price-tag. Comfort is very good, I assume because the carbon absorbs some road vibration, and thanks to the curved profile and perineum groove. With a price-tag of £99 this saddle ain't cheap, but the cost is on a par with similar products from other brands, while lighter carbon saddles can cost up to £200, so the price is fair, though not an absolute steal. The Genetic Monocoque performed very well overall, in that it is light and comfortable. Personally I don't like the colour scheme. Our test model is black with a white stripes (the only colour scheme available). In my book, saddles should be black. And in my experience, white saddles and bar-tape look nice at first but soon turn grey. Would you consider buying the product? To be honest, probably not. I'm happy with a lightweight but non-carbon saddle that's just as comfy but costs half the price. Would you recommend the product to a friend? Yes, if they wanted to combine good comfort, low weight and fair price. Overall, this is a good piece of kit when compared against other carbon saddles. 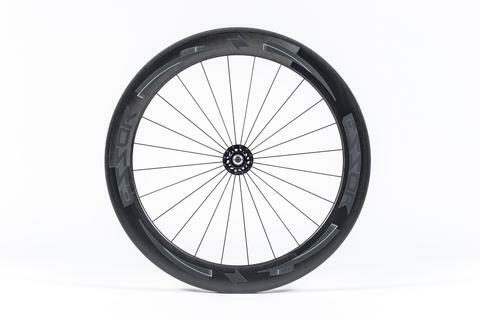 Of course you can get something much cheaper, and almost as light, but it won't be carbon, and it may not be as comfortable. Taking those three key aspects together, the Genetic Monocoque Carbon saddle is a good mix of low weight, fair price and good comfort, and on that basis scores a deserving 8. And their debut album 'Pubic Symphysis'. A sensitive work if ever there was one.